Illustrations: 25 b/w illustrations, 1 line figure. 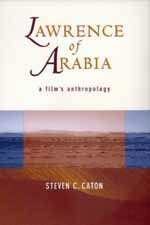 Combining ethnography, film criticism, and his extensive knowledge of the Middle East, Steven C. Caton presents an innovative and fascinating examination of the classic film, Lawrence of Arabia. Caton is interested in why this epic film has been so compelling for so many people for more than three decades. In seeking an answer he draws from situations in his own life, biographies of the film's key participants, and analyses of issues relating to class, gender, colonialism, and cultural differences. The result is a many-prismed book that poses important questions of ethnographic representation and the discourse of power. Caton's approach is dialectical, and his readings of the film are situated within different historical periods, from the early 1960s to the present. Among the subjects he highlights are travel and colonialism in fieldwork and filmmaking, orientalism in the representation of the Other, and the film's ambiguous handling of masculinity and homosexuality. Caton looks at his own reactions to the film at various stages in his life and offers a thought-provoking account of the film's reception by today's high school and college students. Steven C. Caton is Professor of Modern Arab Society in the Department of Anthropology at Harvard University and the author of Peaks of Yemen I Summon: Poetry as Cultural Practice in a North Yemeni Tribe (California, 1990).